Using your iPad to create graphics at work doesn’t always entail illustrations or composited marketing images. Sometimes it means diagrams, such as for flow charts or org charts. If you just want to draw diagrams, consider the $8.99 Grafio instead. It’s simple but powerful. As do many graphical tools for the iPad, it displays its drawings as thumbnails on its main screen. 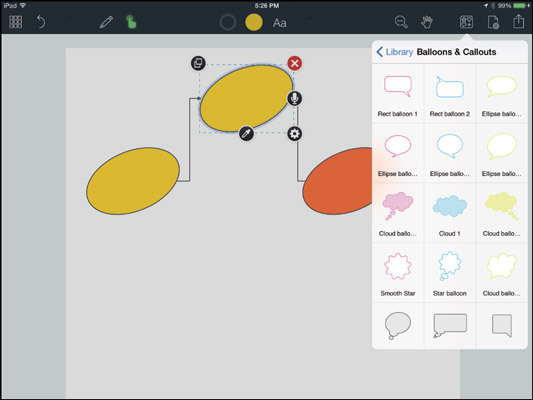 Tap a drawing to open and work with it, or tap the Add button (the + icon) to create a new one. When you’re creating or editing a diagram in Grafio, you see a bevy of controls at the top of the screen. But you’ll work with just a few of those most of the time. The two key tools are Draw (the pencil icon) and Select (the icon of an index finger). You tap Draw when you want to draw something, and you tap Select when you want to adjust or format something. By default, when you draw on the screen with your finger or stylus, Grafio tries to recognize the shape and clean it up for you. So your uneven circle becomes a nice ellipse, and your slightly wiggly line becomes a straight line. You can modify a shape by tapping it once to get the controls and then, after a brief pause, tapping it again to get the resizing handles that practically every graphics program uses. Drag a handle to resize or reshape the object as desired. If you want to draw truly freeform shapes, tap the Preferences button (the icon of a page with a gear) and set the Shape Recognition switch to Off in the Preferences pop-over that appears. You also have options for snapping objects to each nearby one, for easy object alignment, and to display a grid for easier visual alignment. You set the stroke and fill for both new and selected objects using the buttons in the center of the button row: Stroke, Fill, Text, and Connectors. (The Connectors button appears only if a line is selected or if the Draw tool is active.) Tap a button to get its formatting pop-over. Connectors are lines that connect objects to each other, optionally with arrowheads or corners. Grafio knows that you want a connector when you draw a line from one shape to another. The trick is to start that line inside an object and end it inside the other object that you want to connect. If you want a special shape, you can get it from the Library. Tap the Library button (the icon of a collection of shapes) and then choose the desired category of shape to see what’s available. Drag the desired shape onto your canvas to add it to your drawing. Copy (the icon of overlapping squares): Copies the shape you select. Delete (the X icon): Deletes the selected object. Voice memo (the microphone icon): Lets you record notes for an object via the iPad’s microphone. If an object already has a voice memo, the icon changes to a Play button. Formatting (the gear icon): Displays the Fill pop-over. But you could just as easily tap the Fill button instead, as well as the Stroke, Text, or (for connectors) the Connectors buttons to change those attributes for a selected object. Sample (the eyedropper icon): Applies the colors of an object you tap to the current object. The other buttons to note when drawing are the Undo button (the left-facing curved arrow icon) and the Redo button (the right-facing curved arrow icon). Grafio saves your changes as you make them, so it has no Save option anywhere. But it does have the Share button that, as it does in any app, lets you email, print, and share a drawing via social media. The Share button also lets you copy the drawing to iTunes, Box, or Dropbox, or open the drawing in any compatible app on your iPad. But the Share pop-over has one feature that you won’t find elsewhere: the capability to create a video from your drawing, via the Video Presentation option. This feature creates a video saved in the Photos app that re-creates the drawing step by step in the same sequence as you built it in Grafio. It’s a great tool for showing a flow in action.